Pennsylvania covers 44,817 sq miles. It has a population of 12,281,054 per the 2000 census. The capital city is Harrisburg. The ten largest cities are Philadelphia, 1,517,550; Pittsburgh, 334,563; Allentown, 106,632; 103,717; Upper Darby, 81,821; Reading, 81,207; Scranton, 76,415; Bethlehem, 71,329; Lower Merion, 59,850, and Bensalem, 58,434. Pennsylvania’s statehood came Dec. 12, 1787, making it the 2nd of the original 13 states to ratify the Constitution. 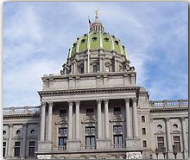 State symbols are: Nickname, Keystone State.Motto, Virtue, Liberty and Independence. State Bird, Ruffed Grouse. State Flower, Mountain Laurel. State Tree, Hemlock.